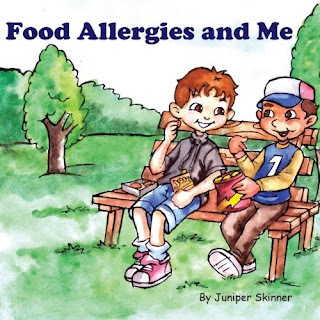 I read the book Food Allergies and Me. I like the pictures. The rules for food allergies are good. We follow them at school. We carry Epi-Pens, too. Jack's test at the doctor tickled. My test hurt. It's a good book to read at school. Maybe I should expand that a little! This book is clearly a labor of love by the mother of a food allergic child. It takes the reader through the daily experiences of her son Jack, as he successfully navigates the very real dangers of allergies to milk, eggs and peanuts. (These are allergies my son shares.) The guidelines for managing multiple food allergies are solid and explained in an age appropriate manner. Jack clearly explains how to avoid contact with dangerous foods by asking a parent if food is safe, washing hands and not ever sharing food. The symptoms of anaphylaxis are also described simply and in a non-scary way with the all important advice to always tell an adult right away in the event of hives, nausea or breathing difficulty. The Kid spotted the only real omission: no reference to keeping epinephrine or other medication available at all times. He also felt that the description of the testing done by the allergist may have minimized how uncomfortable it was! Food Allergies and Me is an excellent introduction to the subject of food allergies for early elementary aged children and younger. It would be a very good choice to read to a classroom with one or more food allergic students in it or make a thoughtful donation to a school library. follow The Allergic Kid on Twitter. Be sure to leave a separate comment for each additional entry. The contest will close at midnight January 31st EST. I'll choose a winner with Random.org and contact that person. If I don't hear back within 48 hours, I'll redraw. I'll forward the winner's information to Juniper and she'll send out the book. Update: I confirmed the contest requirements with Juniper, and this contest is limited to the United States and Canada. FTC Disclosure: There were no wardrobe malfunctions in the writing of this post, unless you count wearing old sweatpants around the house. Oh, and I got a free book. I think this sounds like a great book for both my allergic kids to take to their classrooms and read! I'm not entering as I don't have a little one, but had to say that the kid's review is so cute!! Just liked Allergic Kid on FB. LOVE your lunchbox ideas! My little guy is allergic to milk egg peanut and tree nut too! Also liked Food Allergies and Me on FB! And following Mama Juniper on Google Friend Connect! Thanks for hosting this giveaway!! Also followed Allergic Kid on Google Friend Connect! I love The Kid's review! Excellent, and I'm so sorry his test didn't "tickle". 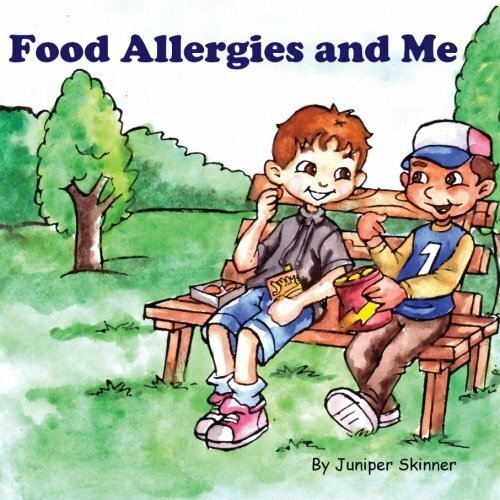 This sounds like a fantastic book that young kids need to read - not just those with allergies, but it could help their classmates to better understand food allergies as well. And I just followed you on Twitter, but it's because your my pal! i am going to follow the allergic kid on facebook. I have two kids who have severe food allergies to dairy, egg, peanut and sesame seeds. This would be such a great book for my kids and I to read together. We already have a great book on asthma, but not for food allergies. This would be really nice to have, and I would also be honored to do a review of it on my blog if I were to win a copy. Thanks for this giveaway! i liked the Allergic Kid on Facebook! My oldest son has 6 of the top 8 Food allergies! he's almost 3 and this be great to read to him and his friends who are a little older!